Biofertilizers are the nutrient availability systems in which biological processes are involved. These biological systems are the essential part of life of several microbes found in soils and provide nutrients like nitrogen, phosphorus and several beneficial compounds for crop. Presence of these microbes makes soil alive and capable for sustainable support to the life of crop, the another life. During the last fifty years due to the high use of synthetic fertilizers not only : overall soil fertility is decreased but also these biological systems the adversely affected, visible in the decreasing trend of production even after using higher doses of fertilizers. Besides, the use of synthetic fertilizers is causing several environmental problems. revive the soil health and living which support to a sustainable production stem the soil environment need to be made congenial for living of the useful microbial population, responsible for continuous availability of nutrients form natural sources. In this book, the concept of making soil live for sustainable production is discussed. In chapter One, The organic matter which is the food and provide c living environment for life in soil, is discussed with sources and dynamics. In chapter Two, Earthworm are not only good composter but also a indicator of health of life in the soil and even a farmer can easily know about the health of soil in his crop field. Considering these important roles of earthworm the information on vermiculture is given in chapter Three. After making the living environment the scope, function and field applications and several other aspects of soil microbes responsible for Nitrogen fixation and Phosphorus mobilization are discussed from chapter Four to Seven. Chapter Eight deals with the holistic approach for making an autonomous cyclic mechanism of resources specially for nutrient for long term sustainability. 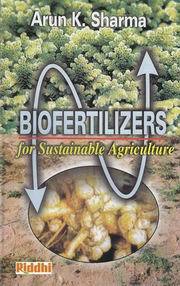 In the chapter Nine, several aspects related to promotion the use of biofertilizer have been discussed. Hopefully this book will provide all information for reviving of soil life/health with biofertilizer use to make long term sustainable production systems. Bibliographic Information: 14 X 22 X 2.5 cm.